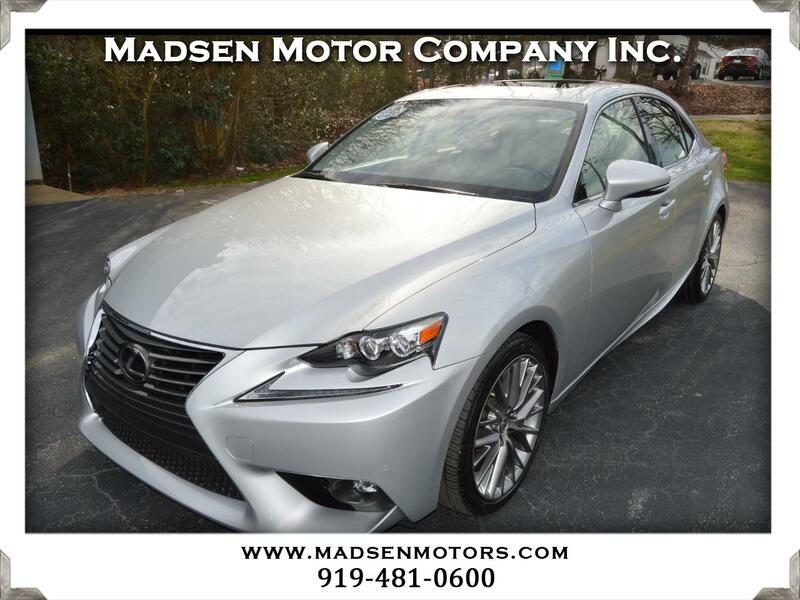 Used 2016 Lexus IS 200t for Sale in Raleigh, Durham, Cary NC 27511 Madsen Motor Company Inc. Here's a super-low-mileage 2016 Lexus IS200t with only 18k miles and over $6,000 in factory options! This nearly-new car is Silver Lining Metallic with Stratus Gray Interior and Illustrious Piano Black trim and is well-equipped with Blind Spot Monitor w/Rear Cross-Traffic Alert, 18" Aluminum Alloy Wheels, Navigation System (w/Remote Touch Interface, Lexus Enform, Destinations, and App Suite, Voice Command, Lexus Insider, Electrochromic Auto-Dimming Rearview Mirror), Intuitive Park Assist, Premium Package (LED Headlamps, Heated & Ventilated Front Seats, Backup Monitor), Premium Plus Package (Power Tilt/Telescoping Steering Column, Rain-Sensing Wipers), Dynamic Radar Cruise w/Pre-Collision System), and much more. It also comes with a clean, 1-owner CARFAX history and the balance of the Lexus New Car Warranty until 11/24/2020 or 50,000 miles, whichever comes first, and the Lexus Extended Powertrain Warranty until 11/24/2022 or 70,000 miles, whichever comes first. Buy with confidence from Madsen Motor Company - voted ''Best Pre-Owned Car Store'' 4 years in a row in the Best of Cary awards!